You might have known that almonds are good for you, but how much do you really know? Today, I want to talk about how important this super food is for our bodies, and especially, to help me with glowing skin. If you’re not a fan of nuts or just almonds specifically, it’s okay. Let me tell you about some alternatives without having to chew on raw almonds yet still be able to get all the benefits! There’s a generous amount of healthy fats, fiber, protein, magnesium and Vitamin E (the one that’s good for your skin) in almonds. Regular consumption can even lower blood sugar levels and lower cholesterol levels. I personally have a very high cholesterol level, so almonds are a huge part of my diet. There’s also millions of articles that explain the benefits (helps fight cancer, helps maintain bone density, helps prevent heart attacks, etc.) BUT honestly, I just don’t know to that extent. One thing I do know for sure, is that, it’s been a key ingredient to help my complexion. It just gives you really good skin! Almonds are rich in Vitamin E, which is a powerful antioxidant, and therefore is essential to have healthy, gorgeous skin (and we all want that, right?). 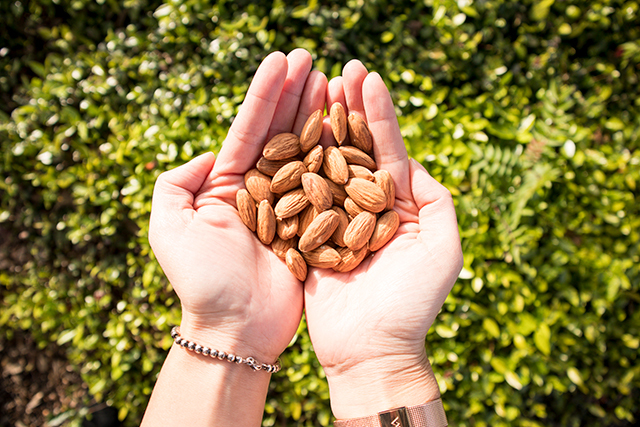 It’s been scientifically proven that 23 almonds a day (no more or no less) is recommended! Why? A handful of almonds which is usually about 30 grams, comes out to 23 almonds. 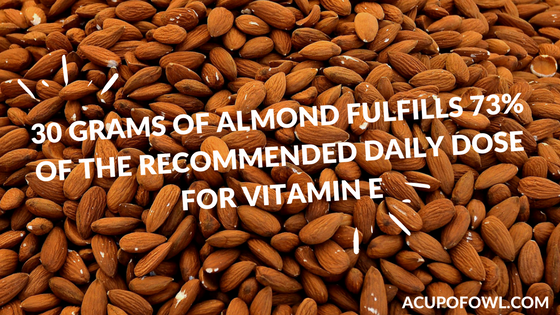 Having 30 grams of almonds fulfills 73% of the recommended daily dose for Vitamin E. Currently, Americans get only half of the recommended Vitamin E each day, so it’s really important to include almonds in our diet. It’s an excellent food source for those with dry skin that wrinkles easily or with rough skin as well! Just make sure to get the raw almonds, not salted. I recommend just snacking on almonds one by one throughout the day because it’s difficult to consume 23 in one sitting (at least for me it is)! Not a fan of almonds? Well. Almond Butter– This is a great alternative if you’re not a peanut butter person like I am, and you don’t want to chew on almonds. I use almond butter to eat with apples or bananas, and it’s great for breakfast or snacking! Tip: Vitamin C does GREAT with vitamin E, so taking almond butter with fruits rich in Vitamin C is best. Almond Milk– Not a fan of nuts? Almond milk is the easiest way to consume almonds without having to chew almonds. I started substituting all my dairy products for either almond milk or coconut milk depending on the situation. Nowadays, you can find almond milk anywhere; if you have the option to, choose to! Almond Powder (Almond Flour)– The options are endless with almond powder. If you want a gluten-free diet and you’re looking to bake without grains, this is fabulous! You can add almond powder into smoothies like I do (see my beauty juice post), or it’s a great addition for salads and chicken plates.To give you an estimate of how much the powder compares to the raw almonds, one cup of almond flour is about 90 almonds. thanks to this article. Nice read. I love almond butter and i love nuts too.